فنایی مرحمت, لیلا, زالی, محمدرضا, رضوانی, مهران, کردنائیج, اسداله. (1396). ارائه مدل مفهومی یادگیری کارآفرینانه سازمانی. 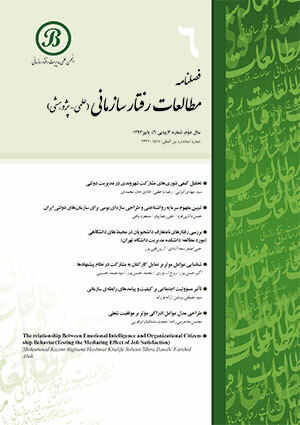 مطالعات رفتار سازمانی, 6(3), 33-54. لیلا فنایی مرحمت; محمدرضا زالی; مهران رضوانی; اسداله کردنائیج. "ارائه مدل مفهومی یادگیری کارآفرینانه سازمانی". مطالعات رفتار سازمانی, 6, 3, 1396, 33-54. فنایی مرحمت, لیلا, زالی, محمدرضا, رضوانی, مهران, کردنائیج, اسداله. (1396). 'ارائه مدل مفهومی یادگیری کارآفرینانه سازمانی', مطالعات رفتار سازمانی, 6(3), pp. 33-54. فنایی مرحمت, لیلا, زالی, محمدرضا, رضوانی, مهران, کردنائیج, اسداله. ارائه مدل مفهومی یادگیری کارآفرینانه سازمانی. مطالعات رفتار سازمانی, 1396; 6(3): 33-54. طی دو دهۀ اخیر مطالعات یادگیری کارآفرینانه با تمرکز بر نحوۀ یادگیری فرد کارآفرین در فرایند کارآفرینی، مدل‌های متعددی از این پدیده را ارائه نموده‌اند. به‌دلیل عدم توجه این مدل‌ها به تعاملی‌بودن یادگیری در بستر جمعی، هیچ‌یک از مدل‌های یادگیری کارآفرینانه، قابلیت به‌کارگیری در سازمان‌های از پیش تأسیس‌شده را ندارند. ازاین‌رو در این تحقیق در چارچوب روش نظریۀ برخاسته از داده و با مطالعه کسب‌وکارهای نوآور شبکه نمایش خانگی، یک مدل نظام‌مند و مفهومی از یادگیری کارآفرینانه سازمانی ارائه شده است که مقوله­های کلیدی این سازه را نشان می­دهد. در این مطالعه با بهره‌گیری از روش نمونه‌گیری نظری، تعداد 20 مصاحبۀ نیمه‌ساخت‌یافته با مدیران ارشد و کارشناسان حوزۀ شبکه نمایش خانگی صورت پذیرفت و درنهایت 3 مصاحبه کنترل متقاطع به‌منظور واکاوی، استخراج و تأیید یافته‌های حاصل از مرحلۀ اول انجام شد. براساس نتایج حاصله مقوله محوری این سازه، مفهوم یادگیری تعاملی، فرصت­گراست که به قابلیت­های پویای ترکیبی به‌عنوان پیامد فرایند منتهی می‌شود. همچنین"جو کارآفرینانه و تغییرات بازار" به‌عنوان شرایط علی، "شبکه‌سازی و معماری سازمانی یادگیرنده" به‌عنوان شرایط زمینه­ای، "عوامل فرهنگی اجتماعی، دولت و دانشگاه" به‌عنوان شرایط محیطی و "راهبرد اثر مطلوب، راهبرد انطباقی و راهبرد اهرمی" به‌عنوان راهبردها در مدل یادگیری کارآفرینانه سازمانی شناخته شدند. Berglund, H., Hellström, T. & Sjölander, S. (2007). 'Entrepreneurial Learning and the Role of Venture Capitalists'. Venture capital, 9 (3), 165-182. Cannavacciuolo, L., Iandoli, L., Ponsiglione, C. & Zollo, G. (2017). Learning by failure vs learning by habits: Entrepreneurial learning micro-strategies as determinants of the emergence of co-located entrepreneurial networks. International Journal of Entrepreneurial Behavior & Research, 23 (3), 524-546. Cope, J. (2005). Toward a dynamic learning perspective of entrepreneurship. Entrepreneurship Theory and Practice, 29 (4), 373-397. Covin, J. G., Green, K. M. & Slevin, D. P. (2006). Strategic process effects on the entrepreneurial orientation - sales growth rate relationships. Entrepreneurship Theory and practice, 30(1), 57-81. Dimov, D. (2007). From opportunity insight to opportunity intention: The importance of person-situation learning match. Entrepreneurship Theory and Practice, 31(4), 561-583. Jones, O. (2006). Developing absorptive capacity in mature organizations: the change agent’s role. Management Learning, 37 (3), 355-376. Kreiser, P. M. (2011). Entrepreneurial orientation and organizational learning: the impact of network range and network closure. Entrepreneurship Theory & Practice, 35, 1025-1050. Leitch, C. & Harrison, R. T. (2008). 'Entrepreneurial Learning: A Review and Research Agenda'. Entrepreneurial Learning: Conceptual Frameworks and Applications. London: Routledge.3-23. Lindsay, V., Ashill, N. & Victorio, A. (2007). An institutional view of local entrepreneurial climate. Journal of Asia entrepreneurship and sustainability, 3 (1), 1. Loasby, B. J. (2007). ‘A cognitive perspective on entrepreneurship and the firm’. Journal of Management Studies, 44, 1078–106. Lumpkin, G. T. & Lichtenstein, B. B. (2005). The role of entrepreneurial learning in the opportunity-recognitio. Entrepreneurship Theory and Practice, 29 (4), 451-472. Lyles M. A. (2014). Organizational Learning, knowledge creation, problem formulation in messy problems. European Management Journal, 32, 132– 136. Macpherson, A. (2009). Book Review: Entrepreneurial Learning: Conceptual frameworks. International Journal of Entrepreneurial Behaviour, 15 (6), 622-628. Marquardt, M. J. (2002). Building the learning organization: Mastering the 5 elements for corporate learning. Palo Alto, CA: Davies-Black Publishing, Inc.
Minniti, M. & Bygrave, W. (2001). A dynamic model of entrepreneurial learning. Entrepreneurship Theory and Practice, 25 (3), 5-16. Peiris, I. K., Akoorie, M. & Sinha, P. (2015). Conceptualizing the Process of Opportunity Identification in International Entrepreneurship Research. Politis, D. (2005). The process of entrepreneurial learning: A conceptual framework. Entrepreneurship Theory and Practice, 29 (4), 399-424. Politis, D. (2008). Does prior start-up experience matter for entrepreneurs’ learning?. Journal of Small Business and Enterprise Development, 15 (3), 472-489. Rae, D. (2011). Entrepreneurial learning: Practice, experience and theory. Paper presented at Entrepreneurial learning and education:From theory to practice. British Academy of Management, 27th May, London. Rae, D. (2012). "Action learning in new creative ventures". International Journal of Entrepreneurial Behavior & Research, 18 (5), 603 – 623. Rae, D. & Rae, D. (2017). Entrepreneurial learning: peripherality and connectedness. International Journal of Entrepreneurial Behavior & Research, 23 (3), 486-503. Rae, D. (2006). “Entrepreneurial learning: A conceptual framework”. Technology Analysis and Strategic Management, 18, 39–56. Sambrook, S. & Roberts, C. (2005). ‘The inter-relationships between corporate entrepreneurship and organisational learning’. Journal of Strategic Change, 5 (1), 14-36. Scarmozzino, E., Corvello, V. & Grimaldi, M. (2017). Entrepreneurial learning through online social networking in high-tech startups. International Journal of Entrepreneurial Behavior & Research, 23 (3), 406-425. Schumpeter, J. A. (1934). "Depressions: Can we learn from past experience?". Chamberlin, Edward, The economics of the recovery program. New York, New York London: McGraw-Hill. Soetanto, D. & Soetanto, D. (2017). Networks and entrepreneurial learning: coping with difficulties. International Journal of Entrepreneurial Behavior & Research, 23 (3), 547-565. Teng, B. S. & Cummings, J. L. (2002). Trade-offs in managing resources and capabilities. Academy of Management Executive, 16 (2), 81-91. Walsh, G. S. & Cunningham, J. A. (2017). Regenerative failure and attribution: Examining the underlying processes affecting entrepreneurial learning. International Journal of Entrepreneurial Behavior & Research, 23 (4), 688-707. Wang, C. L. & Ahmed, P. K. (2007). Dynamic capabilities: a review and research agenda. The International Journal of Management Reviews, 9 (1), 31-51. Wang, C. L. & Chugh, H. (2014). “Entrepreneurial Learning: Past Research and Future Challenges”. International Journal of Management review, 16, 24-61. Wee-Liang, T. & Teck-Meng, T. (2002). “The Antecedents of Value Creation in Singapore Corporations”. Singapore Management University. Young, J. E. & Sexton, D. L. (2003). What makes entrepreneurs learn and how do they do it?. Journal of Entrepreneurship, 12 (2), 155-182.